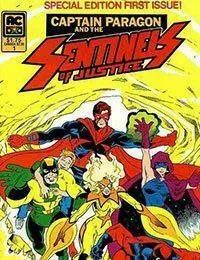 This special edition first issue brings together the top supercharacters in the AC Universe to fight as the Sentinels Of Justice. As Captain Paragon and the newly-powered alien woman called Stardust return to Earth,( following events in Captain Paragon #s 1-4 ) Commando D and Denny Brant make Earthfall as well, on the hunt for bloodthirsty Vardax invaders, ( As started in Americomics #5, and continued in Captain Paragon #4. )little knowing the hideous reptilians already have villainous human allies. When a chance roadside encounter between a Vardax war party and trucker Mike(The Scarlet Scorpion)McCluskey, and mystical visions of alien doom appear to Nightveil, the gangs all here. The Shadows of Legends is written by Dan St. John and Greg Guler, drawn by Guler, and inked by Bill Fugate, Paul Ryan, Bill Anderson, Bill Black and David Matthews. It guest stars Richard and Nikki Latimer, Chromo, Skymaster, Masquerader, Lady Liberty and Electrobolt.